FltPlan now allows you to customize your Passenger Briefing to include your company logo for a one time setup fee of $50. Combined with our new, clean design this provides your passengers with professional and personalized information. FltPlan’s revamped Passenger Flight Briefing gives users ultimate flexibility in the flight information that is provided to passengers. The new design of the Passenger Flight Brief is structured to display information for all types of aircraft and flights. To create a PAX Briefing, log in to your account and from the Main Menu, select Flight Planning, then PAX Briefing. To add your company’s logo, please call 203-262-6020. 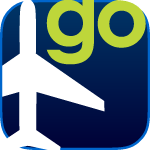 The featured app function in this week’s FltPlan Go Apptitude is the Binders feature. We are finding that many pilots are not familiar with all the ways the Binders can make your trip easier. The Binder feature comes with a pre-loaded binder named Documents. This is where you find any documents you’ve downloaded from the Downloads - Documents section. You can add personalized documents, i.e., V-Speeds for your aircraft, to this tab by uploading them to your FltPlan.com account and downloading them to your iPad. You can create a binder from the Binders section or right from the Airports page (using the folder icon on the top right) and add the Airport diagram, Approaches, Arrivals, etc. Then go into that binder and add your weather for the route, your NavLog, and A/FD. Now that you have all those documents in one place, you can toggle between them. What’s Up in the HUD? FltPlan's HUD feature, located in the Maps section of the FltPlan Go App, has new additions. One is the ETE (Estimated Time Enroute) data field. You can now find the ETE to the next fix on your route and to your destination. In addition, the HUD feature factors in different points along a SID/STAR routing. Also, when flying over a waypoint, the HUD auto-switches to the next waypoint along your route. When passengers ask, “How much longer?” the answer is right there in the HUD. The HUD can be customized as well. If there are any data fields you do not want to be displayed on the HUD, you can interchange them with different data fields. Tap on the data field you would like to replace and a drop-down box will appear with a list of options (Lat / Long, Ground Speed, Altitude, etc.) that you can display on the HUD. Tap on the option you want and the data field you chose will replace what was previously displayed on the HUD. The HUD shows the ETE to the next fix on your route and to your destination. 86.3% of all flight plans for Citation Mustangs and Citation Jets using an N# were filed by FltPlan in February 2015. Voting for the 2015 Pilots' Choice Awards continues until March 31st, so there’s still time to make your opinion count. Go to FltPlan.com today to cast your ballot. Categories include favorite FBO, favorite tower location, and more. Winners will be announced online in April. Click here to check out last year's Pilots' Choice Winners.